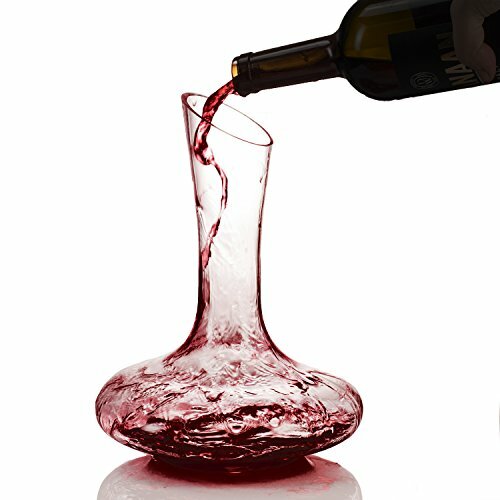 Are you looking for a unique decanter for your wine? Do you want to give your friends the best gift for their home? The Zalik wine decanter is exactly what you need! Every wine enthusiast knows that in order to enjoy the wine's full flavor and scent, you need to let it breathe. The decanter doesn't have any air restriction and it will oxygenate the wine so that it can release its rich aroma and flavor. The carafe can hold 1800ml which is more than two bottles of wine so that you can enjoy your dinner party and entertain your guests without having to open multiple bottles all the time. The wine carafe was specially designed so that it will be practical and easy for you to pour the wine into glasses without spilling it or making a mess. The decanter's elegant design will impress your guests and elevate your table's decoration. The wine decanter is made entirely with hand blown crystal of the highest quality. This elegant accessory will make the perfect gift for your loved ones for every occasion. Give this unique gift to your family or friends for their birthday, anniversary or wedding and rest assured that they will love it. We make sure that we give our customers the best quality products. If for any reason you are not fully satisfied with the wine carafe, we will happily give you a full refund - just let us know! ENHANCE YOUR WINE'S FLAVOR: The wine decanter is not just an elegant way to serve your wine, it will also enhance your experience. The specially designed wine carafe oxygenates the wine and lets it breathe so that it can release its beautiful aroma and unique flavor without the air restriction of your standard bottle. The carafe is ideal for both white and red wine. ELEGANT AND CONVENIENT DESIGN: The wine decanter has a unique and elegant design that will elevate your dinner table's style and make an impression on your guests. The wine carafe is not only beautiful, it is very practical too. The convenient design makes it easy to pour without spilling and can hold 1800ml that is more than 2 standards bottles of wine. PREMIUM QUALITY CONSTRUCTION: The wine decanter is made with the highest quality materials and with special attention to detail to give you the best results. The wine carafe is made with premium quality crystal that is entirely hand blown. PERFECT GIFT IDEA: This impeccably elegant wine carafe will make the perfect gift for everyone close to you. Give this unique gift to your family or friends for their birthday, anniversary or wedding and rest assured that they will love it. LIFETIME REPLACEMENT GUARANTEE, BUY WITH CONFIDENCE: We want you to thoroughly enjoy your new Wine Decanter without a care in the world! So that is why we offer a no strings attached hassle-free lifetime guarantee. Shop with confidence and join the thousands of happy costumers. We have got it covered by a full money-back guarantee - because your satisfaction is the only thing that matters!Please email admin@zalikusa.com with any questions you may have.